In Diner Dash 2, the fast-on-her-feet server Flo helps four other up-and-coming restaurateurs make it big. Building upon the first game, Diner Dash 2 features new customers, items, and upgrades. 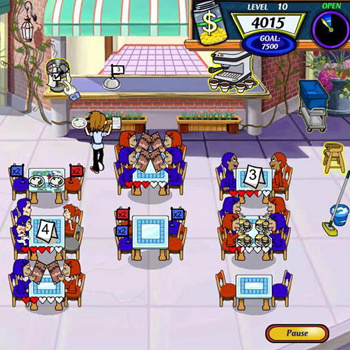 As in the original, players hit buttons that correspond to different actions Flo can take, such as seating a customer, asking for an order, and delivering food. The challenge comes in keeping everything moving so that all patrons get their food and no one has to wait too long. Profits earned from Flo's hard work can be put toward restaurant improvements, which may make service a little easier or add a customer-pleasing item to the menu.